Training room furniture is not the type of furniture that you have to replace regularly. You should consider it to be a one off purchase and something that should be done in the most cost-effective way possible, as it is not necessarily a room that will be used every minute of every working day. But budgeting doesn’t mean that you have to give up other important things like comfort and style. When searching for this type of office furniture, you should be on the lookout for products that are hard wearing and versatile whilst also being visually attractive. By using experienced training room furniture suppliers, you can achieve the look you desire within your budget. No two training sessions will be exactly the same, which means that the training room Furniture supplier needs to offer you adaptable options suitable for many situations. This could include choosing tables than can be easily moved around and chairs that can be lifted without much difficultly or even stacked away when not in use. Rapid Office will be the training room Furniture suppliers to help you to pick the furniture that’s right for your business. Flip top tables are one of the most popular types of meeting table used in training rooms because they are incredibly easy to put together and fold down without a single tool being used. Some models of flip top tables can even fit together if a training exercise requires people to work in groups. Rapid Office can help you source the correct training room furniture in London. Flip top tables are on wheels which means they can be secured for a permanent position or can be easily moved away when not in use. These tables have been specifically designed to allow multiple people to sit around the table without the legs getting in the way. Modular tables are a flexible and adaptable type of office furniture. Even though there are different sizes and shapes, each one fits together perfectly, allowing you to easily reconfigure the layout of the training room to achieve the perfect training room furniture in London. 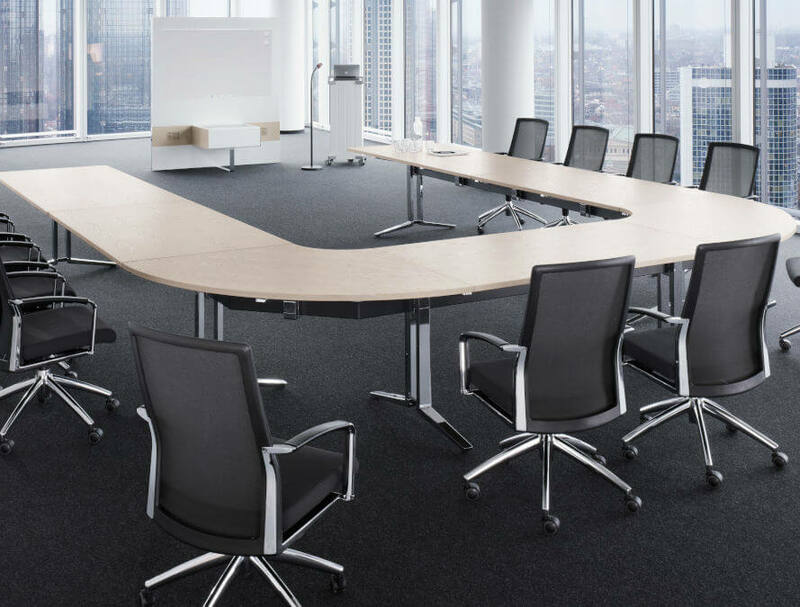 Arranging the tables into full circles, semi-circles or oval shapes, ensures that no one in the training sessions feels left out or inferior when selecting training room furniture in Essex. This can be particularly useful if video technology is involved or a slideshow is being shown, as it allows everyone to get a good view of what is playing on the screen. When one person is talking, they can be seen and heard by everyone around them with the correctly selected training room furniture Essex. If you’re particularly short on space and often have to double up on rooms, folding tables can be particularly useful. They also allow for fast and easy reconfiguration of room layouts depending on the training session that you are hosting. The legs are thin but strong and sturdy and have been especially designed not to interfere with space underneath the table, no matter how many people are sitting around it. This will provide the perfect setting for any training environment or training room Furniture Essex. Many designs of folding tables can be supplied with castors which makes it even easier to change layouts, especially if changes are being done on a regular basis, as they allow for just one person to make changes. Once you have finished using the tables, they can be rolled away and stacked when in storage freeing up even more space. Why Designing a Training Room? When it comes to office training sessions, it is important to establish the right environment as this will make sure that the training gets off to a good start and runs smoothly throughout the session, and part of that means investing in new office furniture. When your participants walk into the room, you want them to feel at ease and that they can contribute to the sessions whenever they want, which is why the layout of the room should be open-planned and inviting to help them feel relaxed and able to speak freely. This can be achieved with the correct training room furniture London.